The Porsche Panamera is a sedan that was released in spring of 2009. The Panamera is one of the largest Porsche vehicles on the market, a noteworthy departure from the brand's well known sports coupes. It was developed specifically to compete in the full size luxury class of automobiles against other high end performance sedans such as the Aston Martin Rapide and Maserati Quattroporte, since it boasts higher performance specs than more common luxury sedans. The United States is the Panamera’s largest sales market, though the car is built entirely at Porsche and Volkswagen Group facilities in Germany. The name comes from the Carrera Panamericana race (like another Porsche model, the Carrera). The race, across the country of Mexico, was held for five years in the 1950s and revived briefly in 2006 and 2007, when the Porsche Panamera was being designed. The Panamera was unveiled at the Shanghai Auto Show in April of 2009. There are a lot of ways in which the Panamera deviates from Porsche conventions, which led to some discord among Porsche fans and auto enthusiasts when the Panamera was first announced. The fact that it’s a sedan is the most obvious source of contention. It’s large (even for its class) and heavy, and contrary to Porsche’s sports cars’ priorities and minimalist approaches, the Panamera is loaded with luxury features to compete with other super luxury cars. And unlike most of the Porsche lineup, the Panamera's engine is mounted in the front of the vehicle, whereas Porsches are generally known for a rear-mounted or mid-engine setup. The Panamera is available with a selection of different V6 and V8 engines, including several turbocharged options and a sole diesel option. The diesel powerplant (which is actually a turbodiesel) is the least powerful, producing 250 brake horsepower and a top speed of 155 miles per hour. The gasoline engines range from a 3.6-liter V6 that produces 300 bhp and a top speed of 160 mph, to the top-of-the-line Panamera Turbo S, which is a 4.8-liter twin turbo V8 that yields 550 bhp and a 190 mph maximum speed. 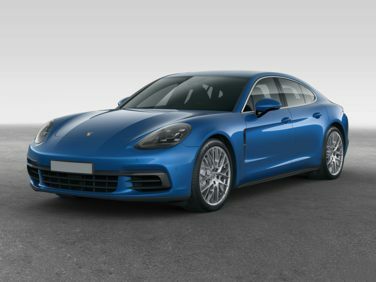 A plug-in hybrid version of the Panamera was released in September of 2013 to complement and broaden the lineup of available powerplants; this model extracts 380 bhp and 188 mph from its supercharged 3-liter V6 hybrid. The V8 models were the first to market, and the V6 and the hybrid Panamera models followed. The Panamera is available in rear-wheel-drive and four-wheel-drive configurations, but they are paired with specific engine options. Generally, the lower performance models are rear-wheel-drive, and the higher performance models are four-wheel-drive. Transmission options also depend somewhat on the engine, and are comprised of a seven-speed dual clutch transmission, a six-speed manual, and an eight-speed automatic Tiptronic S.